When I reach for video games, I usually grab something sports-related or so mething where I can shoot people. I’ll mix in a trivia game or some other group activity type game, now and then, but usually it’s just sporty games and shooters. I have a Wii and a PS3, but I was never really big into the motion sensor games. It’s more novelty than anything else. You can only bowl and play virtual bocce ball for so long. So a couple months ago, I walked into a bar in the Philippines on a hot night. The bar was set up with an Xbox Kinect and a few people we’re casually playing this game, Just Dance 3. I was a bit intrigued and I was there with a bunch of people. It didn’t take us very long to get all into it. A few shots in, we were all crazy involved and sweating it up on this makeshift, video game-assisted dance floor. Just a couple weeks after returning to the States I received a copy of the game to review. Let me start by saying that this game is the ultimate summertime party starter. You can play with up to four players, and once you get a game going, it’s pretty infectious. People have no choice, really. The game just invites participation. 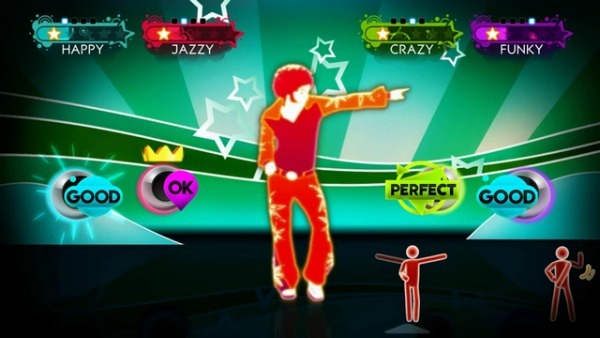 If you’ve never played Just Dance 3 before, let me give you a quick rundown on how the game works. Think of it like a high-energy fitness Guitar Hero, but instead of playing an instrument you have to physically match the dance moves that are displayed on screen. Whether you use a remote on the Wii or PS3, or play using the Xbox Kinect, the goal is the same. You follow an onscreen character’s movements and mimic their moves on your own dance floor. If they jump, you jump. If they spin, you spin. Whatever moves you see on the screen, you need to bust them out to the beat. There are little icons scrolling across the bottom that give you a hint of what’s to come. It’s all pretty easy once you get the hang of it. It’s not hard to imagine how a group dance party competition type thing could really fire up a crowd quickly. This is especially true for ladies. I’m not saying that guys can’t dance, but we just get competitive in different ways. Girls just seem to lose it with this game. I’ve seen it happen on two sides of the Pacific Ocean. If you have a bunch of bored girls at your summer get-together, put this game on and see what happens. Trust me, it works. This thing can also be used in non/party situations, primarily as a personal workout session starter. There are different levels of songs, so if you pick one that’s going to make you sweat, you can burn all kinds of calories real fast. My main gripe with this game is the music selection. There are really only a handful of quality tunes on here. A-Ha, Donna Summer, Daft Punk, Earth, Wind & Fire, Sugarhill Gang, The Buggles – that’s pretty much it. The rest is all poppy trash that you’d only tolerate if you were in an extreme dance-off type competition and you suspended your taste for good music for long stretches at a time. And that kind of happens, so I think it speaks to the quality of the game play when you can shake it down to Britney Spears and still feel good about yourself in the morning. The cool thing about the music selections is that you can actually download more songs that appeared on previous versions of the game. That’ll give you a few more quality options after you’ve been playing the game for awhile. So if you have a Wii, PS3 or Xbox Kinect, and you’re planning to have people over at any point this summer, you should invest in this game. It’s affordable, infectious and a hit with the ladies. Print article This entry was posted by Chris Stout on June 8, 2012 at 11:22 am, and is filed under Entertainment. Follow any responses to this post through RSS 2.0. Both comments and pings are currently closed.